as a secure space and experience during which to process, wrestle with, and make sense of these highs, lows, and the journey itself. Dan graduated from Seattle Pacific University with a BA is Psychology. He continued his education and earned his MA in Counseling Psychology from Southern Nazarene University. He completed his clinical internship at Sunbeam family Services and currently is a candidate for the LPC license. 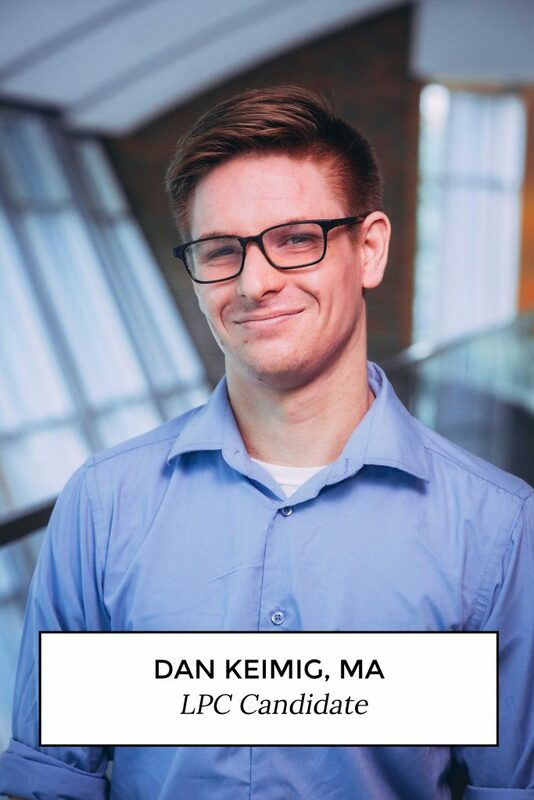 Dan has worked and studied in the mental health field on and off for 5+ years in varying positions including working with youth, residential care, working as a mental health tech, and currently in his role as a therapist. Dan has experience with those who struggle with grief, trauma, anxiety, and depression. He is currently accepting individual clients (over 12 years old) and couples. He has experience and interest in working with clients with spiritual and identity concerns. Dan has knowledge and the ability to utilize the Enneagram with clients who wish to process their experience through that particular lens.